Thank you for sending me on a fascinating journey. Several of you have asked me about gene editing and its implications for animal agriculture. I’m no expert on the topic, so I set out on a journey to learn more. I’m convinced a person could spend an entire year learning about it and still not know everything, but I’m delighted to share some key learnings. My topline conclusion: gene editing has incredible potential. If tapped, both human and animal health could benefit. There is a caveat, though, which I’ll explain. First, what the heck is it? You may have heard references to CRISPR or TALENs, which are both tools used in gene editing (there are others, too). It boils down to making precise, intentional changes in the genetic material (DNA) of plants and animals used in food production, which can improve their health and sustainability. I think it’s fair to say the technology holds almost limitless potential to benefit society and food production. Today, scientists worldwide are using gene editing to help solve a broad array of difficult challenges – seeking solutions to improve human nutrition and health, environmental stewardship and food insecurity. For example, one possible application is to treat sickle cell, an inherited disease that affects 100,000 people in the United States. It can cause severe pain, heart failure and early death. Imagine being able to prevent it. for healthier, more abundant and affordable food while using less water and land. That said, what really captured my attention as a veterinarian is the technology’s potential to address disease in animals. For example, there is a deadly disease that affects millions of pigs worldwide. It’s known as the PRRS virus, which stands for porcine reproductive and respiratory syndrome. One farmer describes it as the most economically and emotionally draining disease for all those raising pigs. Gene editing technology has enabled researchers to develop PRRS-resistant pigs. This application is still being tested, but it’s expected to become commercially available. 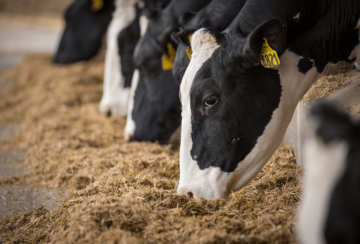 It is difficult to quantify the impact that would have on animal health in terms of reduced suffering and fewer premature deaths, which equates to a reduction in both emotional and economic strain on farmers. Another devastating disease of pigs, called African Swine Fever (ASF), is currently circulating in Europe, Russia and China. Through gene editing, researchers are able to keep pigs healthy by making them resistant to ASF. Other advances currently underway are cows that resist certain mammary gland infections (mastitis), tuberculosis resistant cattle, and chickens that do not transmit avian influenza. This is just the beginning. There are literally hundreds of applications being tested that could potentially make life better for people, animals and the planet. Now, the caveat. The promise of this technology will only be realized if there is adequate public support and acceptance. We know that consumers have a lot of questions. In fact, one study indicates that more than half of Americans want to know more about gene editing. That’s a good thing. Even more importantly, the public is generally openminded about gene editing. In my view, this presents a critical moment of opportunity. Now is the time for those with knowledge of gene editing – whether they be researchers, developers or farmers – to engage. The public deserves balanced, credible information. This can’t and won’t be accomplished if only a few knowledgeable people step-up to engage in the public dialogue. That said, I truly believe the public will see the enormous potential of this technology if their questions are answered in an honest and open manner. There are resources available to those interested in learning more. For example, you can find answers to a series of questions about gene editing from the Genetic Literacy Project. There is a video series about gene editing that touches on both the human and animal health implications on the website Best Food Facts. From a broader animal health perspective, I’ve certainly learned how powerful it can be to simply answer questions honestly and openly. I’m no gene editing expert, but I look forward to learning more about the technology and helping tell its story. I welcome your thoughts and questions. If they are about gene editing and I can’t answer them, I’ll find someone who can. Please feel free to send me an email at AskDrDorman@pahc.com or call me at 844-288-3623.